In my post entitled Insult as Argument in F1, I deplored the fact that insult seems to be accepted as a valid argument these days. Recently we have seen how Max Mosley uses insult to counter the rational arguments of those who disagree with him, the most famous example being his "halfwit" slur on Sir Jackie Stewart. 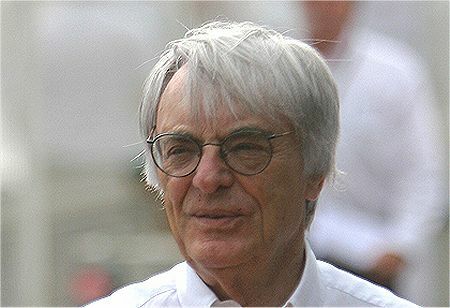 Bernie Ecclestone is no stranger to the tactic, although he is marginally more subtle than Max, preferring inference to direct name-calling. Take Bernie's pronouncements on the furore surrounding the rule changes announced by the WMSC this week, for instance. "The teams must wake up," he says, implying that they must be asleep if they do not agree with the changes. His sole justification for this charge seems to be that the teams are led by engineers. The inference is, I suppose, that engineers do not understand the complex economics of F1 - which is an interesting proposition but needs some explanation before we can accept it as true. Besides, Bernie himself came from a background that has been variously described as entrepreneurship and used car salesmanship; does he really have any greater claim to economic brilliance as a result? His friend, Max, is a qualified engineer and his financial talents must also be in doubt, therefore. That gives us three engineers and six from other backgrounds. It is somewhat amusing that the sole team leader adequately qualified by Bernie's criteria is Sir Frank Williams. Okay, he sold groceries rather than old racing cars, but the sales aspect is relevant, presumably. To be fair to Ecclestone, I am sure that he is really trying to say that the engineers are competitive and do not consider costs when trying to design a car that can beat the others. This is true and always will be in the context of racing but it is the team leader's job to ensure that the budget is not overspent. He introduces curbs on the engineers as a result and has the final say on whether an innovation can be afforded or not - and that happens regardless of his prior qualifications. Bernie is really attacking a viewpoint that is not held by the FOTA members at all. They have already agreed that budget restraints are imperative for the sport and have cut costs by 50%. Their outrage stems from the fact that Bernie and Max have ignored their suggestions for further cuts and instead have gone for a strange half-and-half idea of their own that is almost certainly unworkable. This goes directly against the culture of rational co-operation in implementing changes that FOTA have been trying to establish with the FIA and it is no wonder that Luca di Montezemolo is so infuriated that Max and Bernie have reverted to their old strategy of negotiation by extortion. To then have Bernie support the FIA's position by flippant remarks and jeering adds insult to injury and is not appropriate to the government of an international sport. Such tactics may have worked in the past but they are foolhardy in the circumstances of F1 today. Several of the manufacturer teams remain in the game only through the narrowest of decisions by their boards; the team leaders' task of showing their bosses that they made the right decision is only made more difficult when the administators of the sport behave like boorish bully boys. It's just not funny, Bernie. FOTA has today issued a statement to the effect that, under the terms of the FIA's own regulations, it is too late for the scoring system for 2009 to be changed without the unanimous agreement of the participants. Since that agreement was not obtained, the teams are saying that the FIA's imposition of a new system is invalid. It will be very interesting to see how the FIA reacts, particularly in view of its favored bullying tactics. The FIA has now backed down, stating in a press release that "If, for any reason, the Formula One teams do not now agree with the new system, its implementation will be deferred to 2010." Although this is an obvious attempt to avoid any admission of the FIA's ignorance of its own rules and procedures (there is no mention of the FOTA statement), there can be no doubt that the press release is a response to being caught out by FOTA. As Keith Collantine points out in his post on the subject, the FIA's claim that they thought the teams had agreed to the change is utter nonsense and a demonstrable lie. It is clear that F1 is being run by a couple of guys who are interested in power and money only, this fiasco being only the latest evidence of how they play games to divide any opposition and act without thought for the genuine best interests of the sport. It really is time that this state of affairs was brought to an end. It really isn't funny or clever. It is, however, a typical tactic of the Bernie-Max show. A show that is coming to an end. People who hold too much power cannot be taken down until they have undone their own position. Bernie and Max are providing that opportunity. It was easy to point at the teams as unreasonable when they had differing opinions on just about every issue, but FOTA has given the teams a common voice and credibility. Max has made a fatal mistake in attempting to impose pressure on them via an official rule change. Bernie's sounding off indicates that he and Max are unified, but more importantly it indicates that together they refuse to recognize FOTA as a credible negotiating body, and that is the real mistake. FOTA has played their hand perfectly via an official statement. They are using the FIA's own sporting regulations to refute the arbitrary rule change. It is a sort of political Judo that makes FOTA look stable and reasonable. The FIA and WMSC look like they are flailing about, further damaging the sport. A change of leadership had to happen sooner or later, but Max and Bernie may have created a scenario that allows that change to happen sooner. Marc: I agree completely. FOTA has taken exactly the right tack, pointing at the FIA's own regulations to show that the change to the points system cannot be made legally so close to the beginning of the season. Max and Bernie are now confronted with a dilemma that will be painful to them in the extreme: do they back down, which they will regard as insufferable humiliation, or do they impose the system anyway, thereby demonstrating to the world that they are bandits interested only in their own power and who care nothing for legality. Changes to sporting rules and to all regulations other than those referred to in b) above [Technical design of the vehicle] are published at least 20 days prior to the opening date for entry applications for the championship concerned, but never later than 30 November each year. Such changes cannot come into effect before 1 January of the year following their publication, unless the FIA considers that the changes in question are likely to have a substantial impact on the technical design of the vehicle and/or the balance of performance between the cars, in which case they will come into effect no earlier than 1 January of the second year following their publication. That looks pretty clear to me and is obviously intended to prevent the sort of high-handed unilateral action the FIA has indulged in during this week. Round one to FOTA, Becken. The unfortunate thing is that this will have strengthened Max's resolve to introduce the system regardless of FOTA's objections. He hates to be crossed and cannot bear any challenge to his power. Our only hope is that he is ousted before he can damage F1 further. If it is true that Max hates to be crossed, and will do anything to win the next round, then it is time for FOTA to make a recommendation. It must be something completely reasonable and unmistakably in the interest of the sport. If Max is true to form, he will be hoisted on his own petard. Mosley bringing the FIA into disrepute once again. Nice to see Max finally get his face slapped for riding roughshod over the rules. It just shows that he is surrounded by puppets. In any other organisation someone would have pointed out his error before he made a complete prat of himself. I look forward to messrs Stewart, Lauda and co putting the boot in. Bernie is just being his normal pathetic self. Marc: No doubt FOTA will try to work with the FIA in bringing in necessary changes but this little incident will make Max less amenable to co-operation with the teams. The points system was merely the easiest and most urgent issue for FOTA to fight the FIA on. Much more important from FOTA's point of view is the voluntary budget cap and that is where the real battle will be fought. With Max smarting from his defeat over the points, the battle is going to get vicious indeed. Leslie: Yup, but his rules don't apply to himself, apparently. Steven: Bernie would be pathetic were it not for the fact that it is his games that bring F1 into such sordid situations. I am tired of his arrogance in assuming that only he knows what is good for the sport and the manipulation of others he indulges in as a result. He is more than pathetic; he is poisonous. It's good to see the FIA bitten by it's own dog and the 'half wit' in charge 'spanked' by FOTA. Now FOTA need to sort out the 'cap' before we end up with 'Formula 1½"
Just when it appeard the sport was getting its act together and the various elements finding a way to work together for the common good...Max & Bernie revert to their dark sides and screw it all up again. Jeeez. Don: Nothing changes, it seems. Indeed, leopards do not change their spots. The main point is that FIA has itself strength the FOTA reputation in face of the F1 fans. Now we can at least make an assumption that, if those guys could remain together, they really can run the sport without Max or Bernie. Today was a great day for all F1 fans! Now we can at least make an assumption that, if those guys could remain together , they really can run the sport without Max or Bernie. I am afraid of the likes of Mr.Flavio B'itchy'iratore who in the past have constantly licked Bernie and co's back, we all know even in the medals system what his take was. Everyone wants a paradise, the dark side won't just give in... Hope atleast the races and their results are not fiddled to cause rift between the teams, just think about it, since Mr. Mo'rose'sly is not going to let away the teams that has crossed his path, and having the diffuser issue as a weapon. I pray these shouldn't divide them teams. "That’s the problem with democracy. These teams couldn’t agree with themselves let alone each other. The simple fact is that because the sporting regs are out the FIA cannot do anything for now, but we will do next year. There is nothing the teams can do about it then. For now it’s just a shame that fans, the sporting public, may not see the kind of racing they would have done under the system I put forward." Becken: I think we're all holding our breath, hoping that FOTA can stay united. Max and Bernie are trying their utmost to split the organisation. Arun: It's true that we don't want the sport to be entirely governed by the teams - there are just too many vested interests there to reconcile (which is why unity remains so important to FOTA). The governing body has to be independent and yet be prepared to listen to all the various interests of the parties involved in F1: the teams, the circuit owners, the fans and the commercial rights holders. Keith: Thanks for the heads-up - I am a little late in starting my rounds this morning. That sounds like one angry little man. But so typical of Bernie at his worst, certain that only he understands F1 and careless of who he insults in his determination to get his own way. It's obviously hurting that FOTA has been united so far! Anyway, Appendix 5 invalidates all the changes made in February as well as those made this week. Since neither the Technical Working Group nor the Sporting Working Group have agreed to any of the changes in those revisions to the regulatory documents (and both were after 31 November 2008), then the F1 Commission cannot have voted on them, let alone agreed and the measure cannot be sanctioned. Unless this condition is met or the FIA acknowledges the Concorde Agreement or similar future documentation (if any such documentation is signed), the FIA can never introduce this regulation. For it is only the Concorde Agreement that gives the FIA any power in F1 beyond requiring the manufacturers to participate and thus only the Concorde Agreement that makes Article 199 of the International Sporting Code valid. "That’s the problem with democracy." This isn't a problem related to the structure of power - it's a problem related to adherence to regulation and self-consistency. "These teams couldn’t agree with themselves let alone each other." They unanimously agreed that they didn't want medals, but wanted 12-9-7-5-4-3-2-1 instead. And putting "themselves" and "each other" when the subject is "the teams" is grammatically redundant. It was the FIA that couldn't agree with itself! "The simple fact is that because the sporting regs are out the FIA cannot do anything for now"
It could if it could be bothered to follow the Appendix 5 procedure. But it couldn't, so it can't. "but we will do next year." Presupposing that this idea is even in vogue again before June 30 2009 when, according to the Technical Regulations, rule changes will be set in stone, Appendix 5 of the Sporting Regulations still needs to be adhered to unless the FIA gets either the consent of all the teams - by fax or in-person vote - or Appendix 5 itself is modified through the Sporting Working Group and the F1 Commision's agreement. Bernie has little to do with it. There is nothing the teams can do about it then. See previous section. There's everything the teams can do about it then - and if the FIA declines to do anything about it, the teams may cite the repudiation of the contract formed by the Concorde Agreement as reason to leave and bill the FIA for the costs of their leaving. For now it’s just a shame that fans, the sporting public, may not see the kind of racing they would have done under the system I put forward. Most of them preferred the old system anyway - at least out of those who I've asked, heard or read about. It's a fine analysis, Alianora, but the FIA don't seem to care. This is further complicated by the present position of the Concord Agreement - the teams say the old one is still in force, the FIA say it has expired and is no longer relevant therefore. Much depends on how far FOTA is prepared to fight the FIA over any changes to the regulations. If they stick together (and I'm sure Max and Bernie are hoping the teams will start bickering) they stand a chance of prevailing. Otherwise, we can resign ourselves to more years of F1 suffering the ministrations of the Terrible Two.